Submitted by SCAW Volunteer Chris Hills, Seaforth, ON. At the recent fundraising supper held in the Heartland Community Church, on March 22nd, generous donors supported the "Harvest of Love", a feeding programme organised by Charie Hendricks, and "Sleeping Children Around the World." The proceeds of the supper provided twenty-eight bed-kits for the most recent distribution in the Philippines. 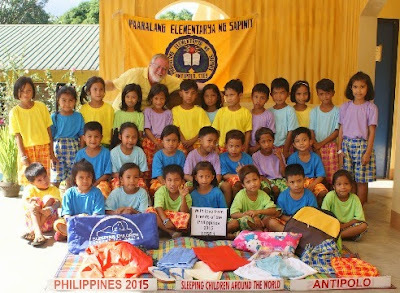 On April 6th, 28 Filipino children were the happy recipients of bedkits. As each child received their bedkit, they blessed the Canadian volunteer with a whispered "Salamat po." A thank you to those donors far away who shared their good fortune with an unknown child. In total 5,000 bedkits were given to children at sixteen locations across Luzon, Philippines.